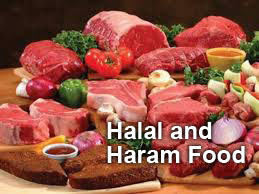 Rules about halal eating and drinking. What must a Muslim Eat? What is Forbidden for a Muslim in eating? "O People, eat from the land what is permitted & good & do not follow in the footsteps of Shaitan, for he is an open enemy to you." 1) - Plants, fruits, vegetables and grains: All of these can be eaten as long as they are not harmful and poisonous to human beings. Domestic animals such as Camels, Cows, Goats and Sheep are permissible to eat. Wild Animals such as mountain sheep, wild cows and asses, gazelles and deer are permitted. Animals that possess canine teeth or fangs aur forbidden from eating for a muslim such as dogs, rabbits, elephants and monkeys , snakes and tortoises. Insects such as fleas and lice are also forbidden. However, locusts are permissible. There are specific verses in the Holy Qur'an forbidding the eating of a pig. Eating the meat of a horse, donkey or mule is Makruh (undesirable). i- The body is covered with feathers. ii- They are not classes as birds of prey (possessing talons). i- Every bird which, when in flight glides more than the flapping of its wings cannot be eaten. a gizzard (part of the stomach) or a projection (a fork-like extension on the bird's foot which performs the function of a talon).